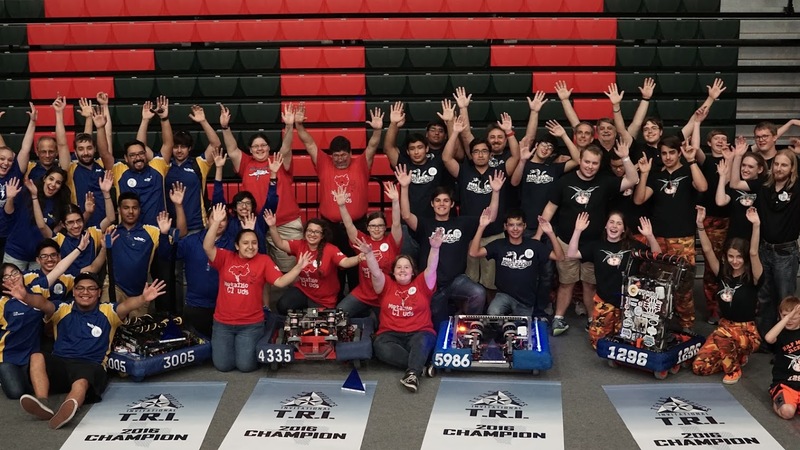 After being “this close” to our first blue banner at the Alamo Regional, Dallas Regional, and then Curie finals this season… we are pretty stoked for our first “light blue” banner courtesy of the entire crew that has turned Texas Robotics Invitational into the polished and widely attended event it is today. Unfortunately, we weren’t able to change much on our robot before this event, but thanks to a solid alliance with 1296, 4335, and 5986, as well as an admitted bit of luck, we were able to sneak in a victory. After losing yet another round of seniors (not sure why that keeps happening every year! ), it was good to see a number of students stepping up into new or bigger roles. We’re looking forward to competing again at TRR in late July, as well as preparing for another successful season in 2017.